Love To Hate Nickelback? Joke's On You The band's name has become shorthand for everything reviled about modern rock. But the band is among the most successful money-makers in the music industry — and they're laughing all the way to the bank. Nickelback's Chad Kroeger performs during halftime of a Canadian football game in Vancouver. On the band's own tours, expensive pyrotechnics are more rare. Nickelback. The name itself is musical shorthand for everything music aficionados love to hate about modern rock. But with more than 50 million record sales worldwide and a lead singer who earns $10 million a year, the band is laughing all the way to the bank — as reporter Ben Paynter describes in Bloomberg Businessweek Magazine. To start with, Paynter tells weekends on All Things Considered host Guy Raz, the band has worked hard to become ubiquitous in the blue-collar rock scene. You can hear them on the entry songs for World Wrestling Entertainment, commercials for NASCAR's Speed Channel and Michael Bay's bombastic Transformers movie. The band even struck a strategic promotional alliance to have some of their music played during Stanley Cup highlight videos. "If something's getting punched, smashed, broken or otherwise causing chaos, Nickelback is usually the background soundtrack to it," Paynter says. The band also tours on the cheap, under a promotional deal with Live Nation that rivals that of Jay-Z and Madonna. 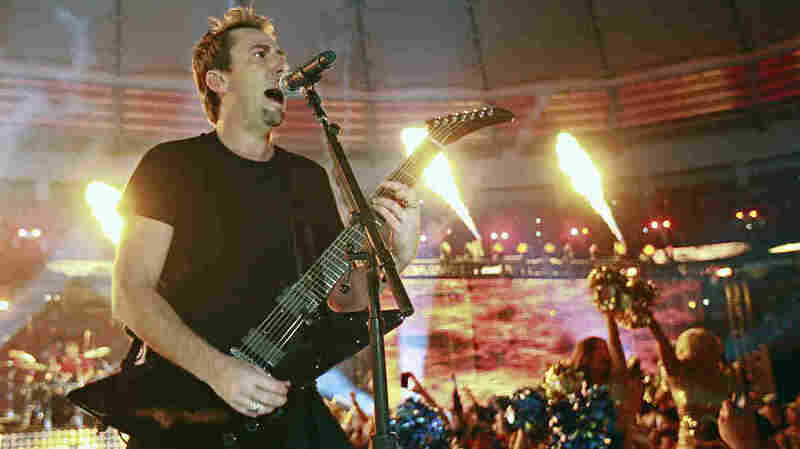 Lead singer Chad Kroeger is an incredibly prolific songwriter, Paynter says, who co-owns 604 Records, the Canadian label that spawned Carly Rae Jepsen's monster summer hit, "Call Me Maybe." Paytner says the label takes a lot of chances on young, Canadian talent. "They just work on building them up in Canada and launching them in the United States," he says. As for the band's take on its divisive reputation, Paynter spent some time with them — and concluded they don't seem to mind much. "These guys know exactly what they do. They do it to a T. They pack stadiums because of it. And they've worked real hard to get to that point."